The Talleys are a joy to work with. When presented with an overabundant crop in 2000, they graciously thinned it down for us, which helped the vines concentrate the flavor they produce into fewer clusters of grapes-and I am certain it made the difference between good wine and special wine. One sniff and it’s obvious what we have here– a very successful wine. The aromas are so charming! A chef from L.A. visiting here a while back stuck his nose into a glass of this wine, smiled, and said it smelled exactly like Bartlett pears, and does it ever! The flavors are lush and concentrated, and a lemony, toasty taste lingers pleasantly on the tongue. 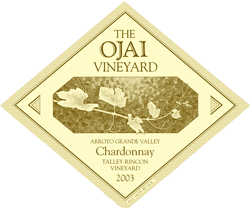 If you are looking for subtlety and fineness, try our Clos Pepe Chardonnay-Talley-Rincon chardonnay is bold and powerful! Made in our non-interventionist fashion, the fruit is gently whole cluster pressed into a combination of new and older barrels. We let the native yeast initiate fermentation, and, when the juice becomes wine, it undergoes the secondary malo-lactic fermentation. In our cool cellar this can take up to a year to complete. The wine is never racked off the yeast lees until it goes into the bottling tank. An old-school winemaking friend called this technique the lazy man’s method of winemaking, but we feel that taking every effort to avoid moving or processing the wine helps us preserve its true character.